Energy Enhancer: The range of nutrients found within bee pollen makes it a great natural energizer. The carbohydrates, protein and B vitamins can help keep you going all day by enhancing stamina and fighting off fatigue; increases strength and endurance causing a decrease in the pulse rate. Treating allergies: Pollen reduces the presence of histamine, ameliorating many allergies, from asthma to allergies and sinus problems. Immune System Booster: Pollen is rich in antioxidants that protect the cells from the damaging oxidation of free radicals. Weight Stabilization: Used holistically for stimulating the metabolic processes, healing addictions and inhibiting cravings by suppressing impulses. It contains lecithin, which helps dissolve and flush fat from the body and thus protects against cholesterol and heart disease. it acts as an appetite suppressant. When you need to gain weight, bee pollen works in reverse. Supports the Cardiovacular System: Bee Pollen contains an antioxidant bioflavonoid that helps strengthen capillaries, blood vessels, assists with circulatory problems and corrects cholesterol levels. 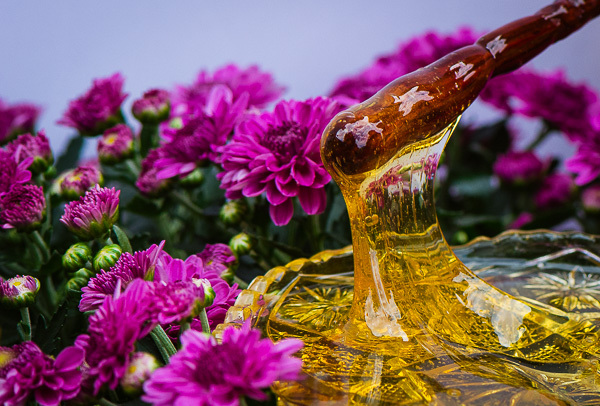 Because of its strong antimicrobial activity, propolis is known as a "natural antibiotic". It inhibits the synthesis of protein by bacteria, which may account for at least some of its antimicrobial effects against micro-organisms like bacteria, fungi, viruses. The flavonoids concentrated in propolis are powerful antioxidants, capable of scavenging free radicals and thereby protecting lipids and other compounds such as Vitamin C from being oxidized or destroyed. It is probable that active free radicals, together with other factors are responsible for cellular aging and degradation in such conditions as cardiovascular diseases, arthritis, cancer, diabetes, Parkinson disease and Alzheimer disease. Oxidative damage may also result in poor liver function. Cardiovascular Effects: Reduces blood pressure, produce a sedative effect, strengthen capillaries, and protects the liver against alcohol. Colitis: Propolis inhibits prostaglandin formation so inflammation recedes and diminishes. Gingivitis (gum infections) and plaque:Antiseptic against pulp gangrene, inhibits the growth of a range of bacterial organisms found in dental caries. Immune System: Propolis activates immune cells which produce cytokines with an anti-tumor effect and stimulates antibody formation. Respirotary Infections: Pharyngitis, chronic bronchitis, rhinitis. Skin Infections: Inhibits the growth of yeasts and fungi. Ulcers: Propolis has anti-inflammatory and regenerative effects. Viral Infections: Influenza, herpes, shingles. Wound Healing and Tissue Repair Effects: Propolis tincture ointment reduces infection and stimulates healing. Reduces blood pressure, produce a sedative effect, strengthen capillaries, and protects the liver against alcohol.Acetylcholine is needed to transmit nerve messages from cell to cell. Too little of this compound makes individuals prone to Alzheimer's disease. It contains gamma globulin that stimulates the immune system and fights infections. Royal jelly contains vitamins A, B-complex, C, D and E. It is particularly useful for its B-complex contents. It is high in the B vitamin pantothenic acid that reduces stress levels. It also supplies calcium, copper, iron, phosphorous, potassium, silicon and sulfur. It produces an age-retarding, longevity effect, helps maintain health, youth and beauty. it restores health, vigor and reproductive functions, tones and strengthens the skin, increases the number of red blood and immune cells. It increases metabolism and improves breathing of tissues which accelerates protein synthesis. It improves the uptake of oxygen by the human brain, which significantly improves the brain activity: attention and memory, ability to work. Contact us for price, product information and to place an order! Did you know that HONEY...? ...is a perfect product of nature as it contains almost all the elements that are necessary to sustain the human body. ...is a super food which contains 75 valuable nutrients, including vitamins B, C, A, beta-carotene, D, E and K; minerals such as calcium, phosphorus, magnesium, potassium, silicon, iron, potassium, iodine, manganese, etc. ...has all of the B-complex needed in the system for digestion and metabolism of sugar. ...returns energy quickly, ensures long-term application of physical stamina and mental stability. ...has a PH of 3.4 - 3.6 and can kill many kinds of bacteria it comes in contact with. ...is raw form has a more therapeutic value; has 63 calories of good carbohydrates and energy in a tablespoon. ...contains monosaccharide (simple sugars), which is more easily assimilated than any other form of sugar. ...it is one of the foods with the highest content of live enzymes, required for the proper functioning of all body systems. ...has very good antioxidant properties. ...provides antibiotic, antiviral, anti-inflammatory, anti-carcinogenic, expectorant, anti-allergic, laxative, anti-anemic effects. ...helps lose weight when taken 30 minutes before bed-time, and promotes natural sleep. ...has been used as a treatment for open wounds, including war wounds. ...bees travel 50,000 miles to produce a single pound of honey. ...is referred to by hieroglyphics as "universal healer", and jars were placed in tombs of the dead. ...stored in air tight containers never spoils. Honey found in sealed containers in King Tut's tomb was still edible, despite being over 2,000 years old. Copyright © 2018 Health And Beauty From The Bees. All rights reserved. Website design and photography by Asya Karapetian's Studio.